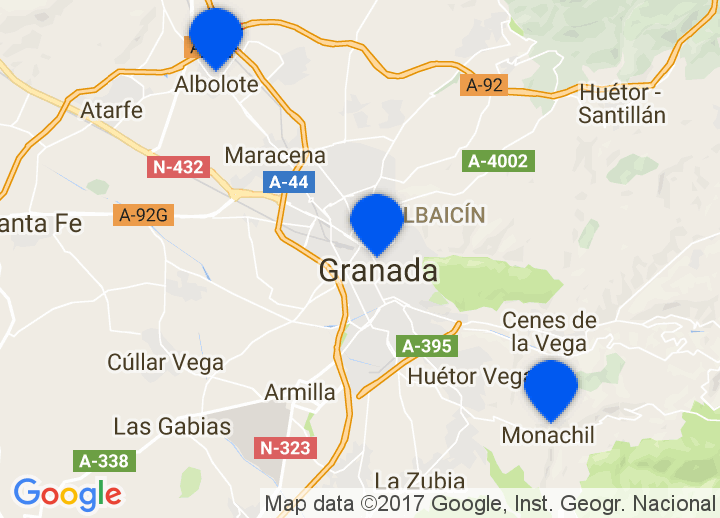 Granada's contrasting geography covers 12.500 km² and reaches vertiginous heights. The Penibética range, which is the highest in the Iberian Peninsula (Mulhacén peak reaches 3.478 metres) and the seaside cliffs are prime examples of this. Granada also has landscapes that vary from the snow, to the sea, passing through the Alpujarra (with thermal baths in Lanjarón), and abundant forest. Almuñecar and Salobreña are outstanding seaside towns, whilst Motril and Castell de Ferro, or the extensive beaches of Albuñol and La Rábita, are not less noteworthy. Granada region includes striking natural landscapes to explore such as the Sierra Nevada, where it is possible to ski and go to the beach all in the same day. Choose from unique selection of boutique hotels in Granada and small hotels and bed & breakfasts, including luxury Granada hotels, fincas and cortijos, amongst others. Whatever your taste, we’ll help you find that perfect getaway in Granada. Obviously you should see the Alhambra because it's one of the most amazing buildlings you can see in the world! But make sure you buy the tickets in advance, because normally it's booked out for months. If you want to see another side of Granada, you can visit Sacramonte with all his caves. Calle Elvira is also very nice to see! You really feel the Arabic influence and you can have a cup of tea in one of the teterías. If you feel like drinking a healthy smoothie, go to La Milagrosa near Plaza de la Trinidad. It's offers the biggest smoothies you've ever seen. Carmela Restaurante offers dishes of very high quality for a good price. They also have the famous croquettes with blood sausage. For a nice and well-produced ice cream, go to Eco De-leite. To go out you should definitely have a look at Chupiteria 69. It's visited by a mix of erasmus (Tuesday) and Spanish people. Mae West is the biggest club in Granda and always full of people. If you want to see something fancier you can go to El Camborio and enjoy the wonderful view over Granada! If you have a drink in Granada, you get tapas for free. They really depend from one bar to the other. Sometimes yo can eat a whole meal free of charge and at other places you don't even get a real tapa. Make sure you don't eat around Plaza Nueva or in the main road Calle Reyes Católicos because you'll pay too much and won't get any real tapas. El mercado: Every person can choose his own one. Nice staff and suitable for vegetarians. El Nido Del Buho: The biggest tapas in whole Granada! Just Spanish people. Not a tourist place at all. La Bodega de Gran Vía: A elegant place with fancy Tapas. They are nicely arranged and a feast for the eyes. Bar Poë: Small, familiar and excellent tapas! You should go early (for Spanish people maybe before 21h) because it's always full.